X-33 History, Development, and Cancellation – I Already Have a Watch. 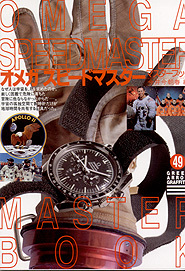 Omega officially launched the Speedmaster Professional X-33 on March 28, 1998, at NASA’s Johnson Space Center in Houston, Texas. The unveiling was conducted in concert with a live satellite uplink to the Russian MIR space station, which already had pre-release prototypes of the X-33 aboard for final testing. The X-33 was conceived and shepherded through development largely by General Tom Stafford, the former NASA Apollo X astronaut who sat on Omega’s corporate board at the time. (Incidentally, General Stafford’s Speedmaster Professional [NASA s/n# 027] from the Apollo X mission is also on display in the National Air and Space Museum, Washington, DC, USA.) 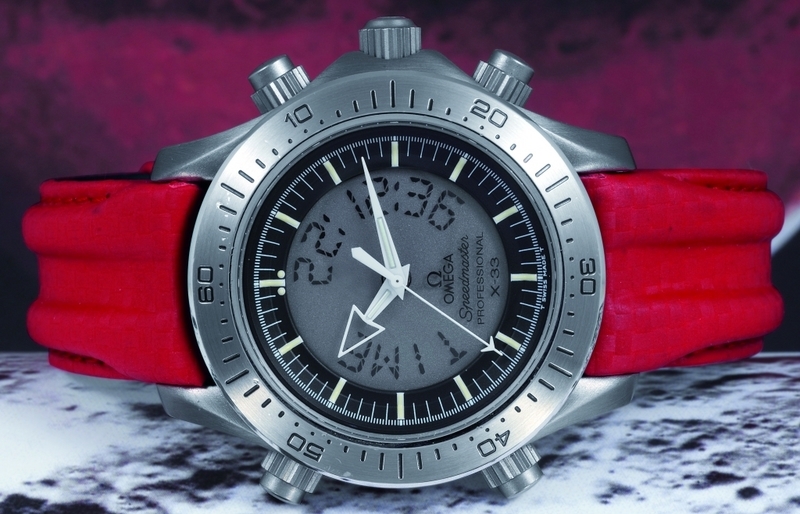 The new watch was intended to update and supplement to the original Speedmaster Professional in use by NASA since the Gemini program, which had been arguably outpaced by the potential of emerging quartz and digital technologies and was no longer adequate to address emerging NASA mission needs. However, the X-33 was never intended to wholly supplant the existing Speedmaster Professional, especially in EVA “spacewalk” roles. In addition to by nature being more resistant to shocks (about 5,000 g’s as opposed to 3,500 on the X-33) the mechanical movement of the original Speedmaster is much better suited to the austerity of space. Battery cells designed for Earth atmospheric pressure can leak under vacuum, and at extremely low temperatures battery chemistry and LCD (liquid crystal) displays can be detrimentally affected and/or permanently damaged by the effects of freezing, to say nothing of the effects of extreme temperatures on the accuracy of a quartz oscillator. 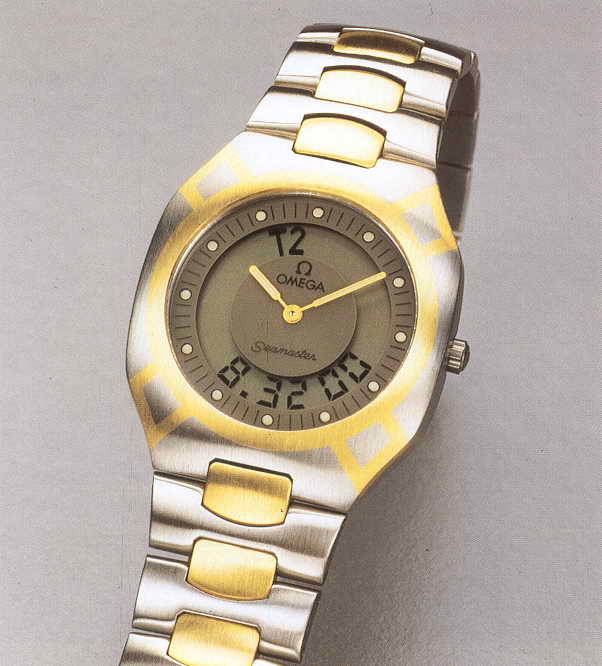 First-Generation Seamaster Multifunction, ~1986. Photograph courtesy Omega Museum. 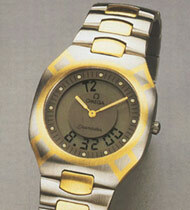 Though it might seem unusual, the X-33’s multifunction analogue/digital design was by no means a new concept to Omega. They already had a very suitable basis for the X-33’s multifunction design and had long been making watches with a similar capability, though with a simpler interface and without the sophisticated mission-specific functions of the X-33. They had after all been making the Seamaster Multifunction since 1986 using the caliber 1665 quartz multifunction movement. The name “X-33” was originally chosen only as the internal development project codename but was later retained as the production modelname. The name was borrowed from the since-cancelled NASA X-33 program. The NASA X-33 program was unfortunately by various accounts somewhat poorly conceived from inception forward, plagued by excesses of wishful thinking and poor engineering. 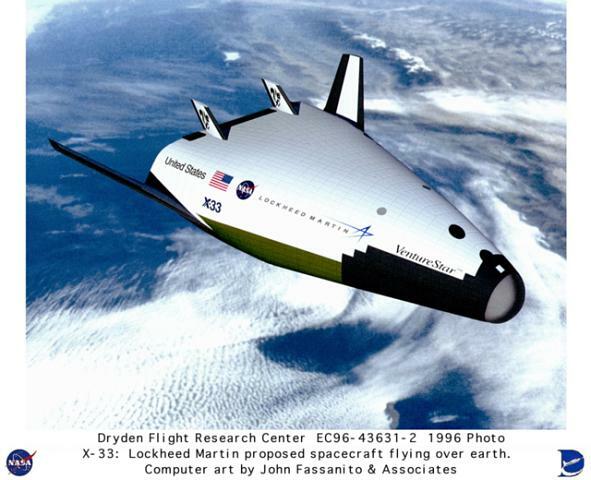 The X-33 was to be a sub-scale demonstrator for the VentureStar vehicle program, hoping to demonstrate the viability of a Single Stage To Orbit Reusable Launch Vehicle (SSTO RLV) using a new generation of aerospike engines that would not require external tanks or boosters. The new vehicle would be under autonomous (unmanned) control, taking off vertically like a rocket but landing horizontally like an airplane. VentureStar was intended to eventually replace the aging Space Shuttle fleet, and by making launches cheaper and more frequent make space more accessible to civilian commercial clients. In collaborative development with Lockheed Martin’s vaunted Skunk Works, the system was intended to be commercially owned and operated with NASA as only one of many potential customers who could use the vehicles to launch commercial and research satellites. 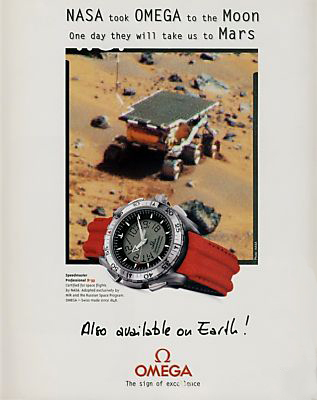 Though neither the X-33 nor the Lockheed VentureStar were intended to be capable of interplanetary flight, Omega’s marketing leaned heavily upon product placement in the movie “Mission to Mars.” Omega subsequently chose a marketing theme of “the Mars Watch” for reasons that seemed inscrutable to space enthusiasts and unfortunately attracted considerable derision. Later in March 2001 NASA announced it would not renew funding for the X-33 program after having already spent $912M on the project prior to its cancellation in ignominy, with a further $357M invested by Lockheed Martin. Note the “feathered” hands designed to prevent obscuration of the digital LCD readout, the (titanium?) 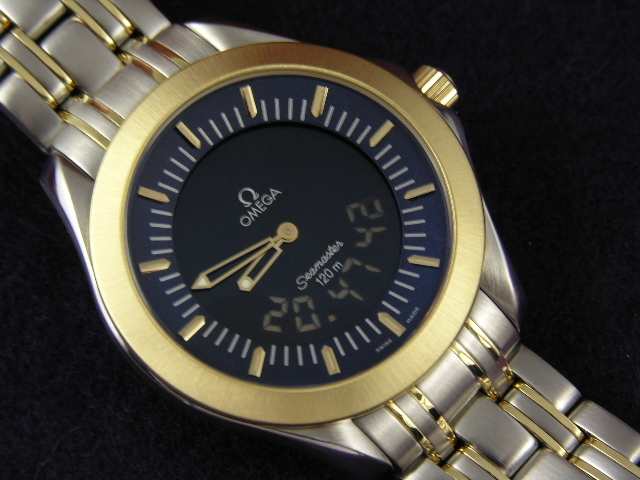 Seamaster “Bond”-style bracelet (never before seen on any Speedmaster before or since! ), and the Seamaster Professional Chronograph-esque case and pushers. One field tester in the project related to the authors of this article that this hand design was well-liked by pilots, but Omega eventually chose the “broadarrow” hand design, perhaps because of the manner in which the style evokes sentiments of the original 1957 Speedmaster “Pre-Professional” hands. Also notice the “T SWISS MADE T” marking at the bottom of the dial, which would indicate the use of tritium luminous material on the dial and hands. This would have been quite unusual for the period, since the industry-wide transition to “Luminova” strontium-based non-radioisotope luminous materials was all but complete by this point. However, tritium and various other radioisotopes are used even still for certain specialized industrial and military instruments for their superior “self-charging” performance during extended periods of darkness as they do not require any external light source to charge. 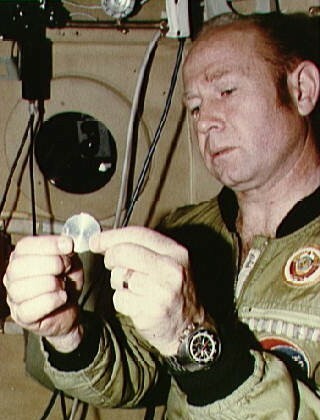 Tritium might even have been a better choice for use aboard spacecraft when the wearer might not see significant sunlight for extended periods. But the final version was offered only with Superluminova, perhaps because of customs and regulatory considerations. Another consideration might well have been that should the sapphire crystal shatter or the case integrity otherwise become compromised aboard a Space Shuttle or ISS mission, the health hazard posed by tritium in a closed and recycled atmosphere could be especially hazardous as it would could not dissipate. Also notice the comma-separated instead of colon-separated LCD readout in the above photo. Just like its ancestral Speedmaster Professional, this early original X-33 design does not have a rotating bezel. Early in the design phase this feature was still deemed more appropriate on dive watches, and perceivef as unnecessary or even redundant on a sophisticated high-tech pilot/astronaut watch already equipped with digital chronograph and countdown timer. 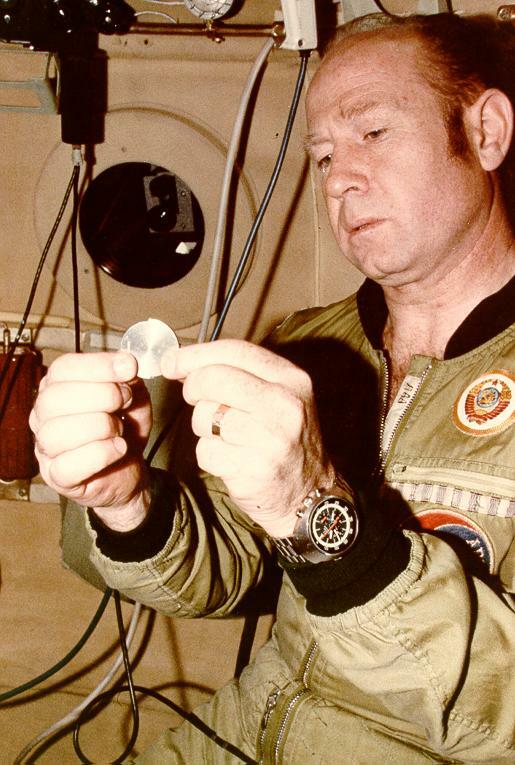 Cosmonaut Aleksey A. Leonev practices with a training mock-up of the ASTP commemorative medal during the Apollo Soyuz Test Project (ASTP). His unmistakably distinctive Omega Flightmaster is clearly visible here in the foreground. 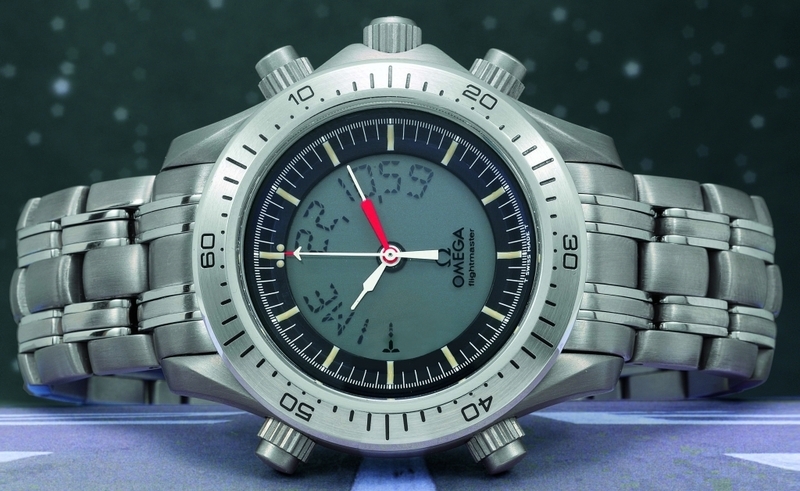 Throughout development Omega made extensive use of NASA experience as well as significant civilian and military pilot input and feedback to refine and improve the design. Omega even went so far as to send prototypes to the field for real-world testing in the intended application and environment. The design team could then consider feedback and implement suggestions from the actual pilots and astronauts who wore the early versions. Sources with first-hand experience of the design testing related to the authors of this article that despite the depictions of such in collector texts there were no distinct “generation” protoype iterations. Instead, changes and improvements were fielded for testing on a semi-continuous basis as they were implemented, and in some cases with hardware and software updates completed within weeks and sent back immediately to the field for evaluation. Suggestions and requests from field testers included an improved and larger digital display with greater contrast for better legibility, improved analog hands that did not obscure the digital display but were easily readable at night, and larger and improved pushers to facilitate operation while wearing gloves. 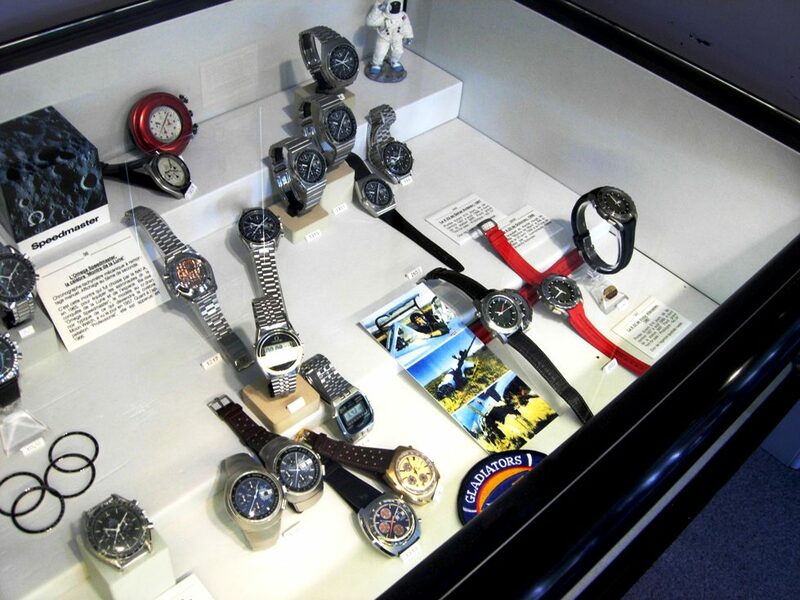 Omega Speedmaster Display at the Omega Museum in Bienne, Switzerland. The “crash tested” X-33 prototype is shown 3rd from right. Photo courtesy Don Aldo. It is not clear if this Seamaster Professional Chronograph-style case and bezel were originally intended to be used or were simply borrowed during development for ready off-the-shelf expediency until the X-33’s case and bezel designs were finalized. In any case as the design evolved the traditional round Seamaster-style pushers shown above were dropped in favor of large, flat pushers, a feature specifically intended to allow ease of operation with gloved hands in flight. The X-33’s Seamaster Multifunction ancestry is also apparent here, especially with the contrasting light-on-dark LCD display. I have to admit I prefer this style of LCD display and wish it had been retained, though perhaps it did not provide the high contrast requested by field testers. Note also the thin Speedmaster Professional-style pencil hands as well that eventually gave way to the “broadarrow” design. Early “Speedmaster Professional X-33″ Prototype with ‘X-33’ printed on dial. X-33 prototypes and drawings of hand designs. Image from “Green Arrow Graffitti #49”. Note spade hands and “compass” bezel. Above is another X-33 prototype design. Note the unusual spade-shaped hands in this early example; this was apparently another early design attempt to balance competing demands of analog hand legibility, LCD visibility, and low-light readability. Ultimately, however, Omega chose the broadarrow-type hands reminiscent of those of the early Pre-Professional Speedmasters of the 1950’s and early 1960’s. The “azimuth” bezel design is amusing; apparently this was an attempt to choose a bezel design that provided some functionality not already made redundant by the sophisticated functions of the microprocessor-controlled quartz chronograph movement. Unless this design had some astronomical survey application of which the authors are unaware, it was likely intended to be used with the old (if not so useful) military trick of “point the hour hand at the sun – halfway between the hour hand and twelve o’clock is south.” This technique of course is of minimal utility on land (if you can see the sun, a watch isn’t altogether necessary for telling direction) and is very nearly entirely irrelevant on a rapidly moving/turning aircraft. This bezel design was thankfully discarded in favor of the unidirectional (on Gen 1 models, updated to bidirectional with Gen 2) 60-minute bezel in the production version to provide supplementary at-a-glance short-term timing capability. What appear to be early versions of flat glove-friendly pushers are visible here as well. Pre-production X-33s flown aboard the MIR space station by Russian Cosmonauts displayed in the Omega Museum in Bienne, Switzerland. Photo by Jean-Michel. See his excellent website at SPEEDMASTER-MISSION.NET for even more photos and info. NASA Astronaut Richard Linnehan wearing an X-33 prototype aboard Space Shuttle Columbia during STS-90, April 1998. The strap appears to be a blue Omega sharkskin, worn by several other astronauts on the mission as well. Also see Jean-Michel’s excellent archive of NASA watch photos for more pictures of Astronauts and Cosmonauts wearing their Speedmasters and X-33s. 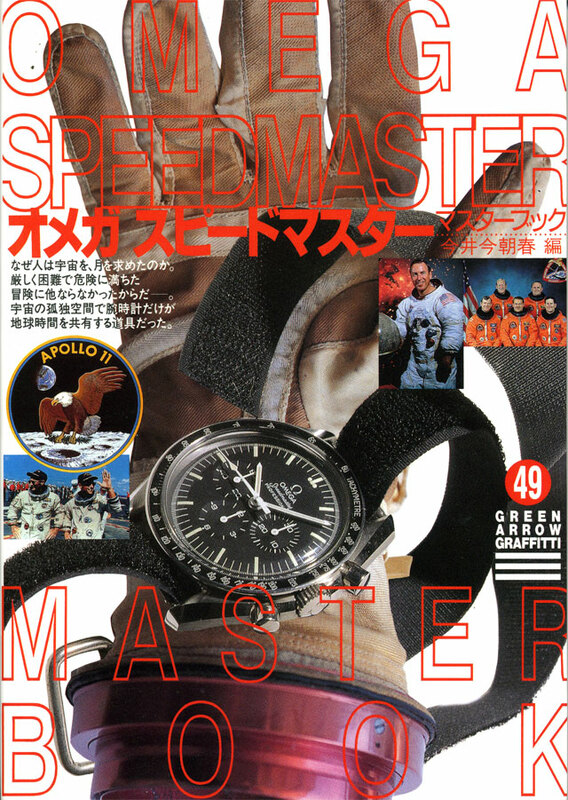 In summer 2006 Omega announced that the Speedmaster Professional X-33 would be discontinued for retail sale. Shortly thereafter however it was determined that the X-33 would remain available to space agencies like NASA and would remain in service for NASA space flight missions. It also still remains available to military aviators under under the Military Pilot Program. While Omega never provided explicit reasons for discontinuation there was much speculation (as always!) among enthusiasts and collectors. 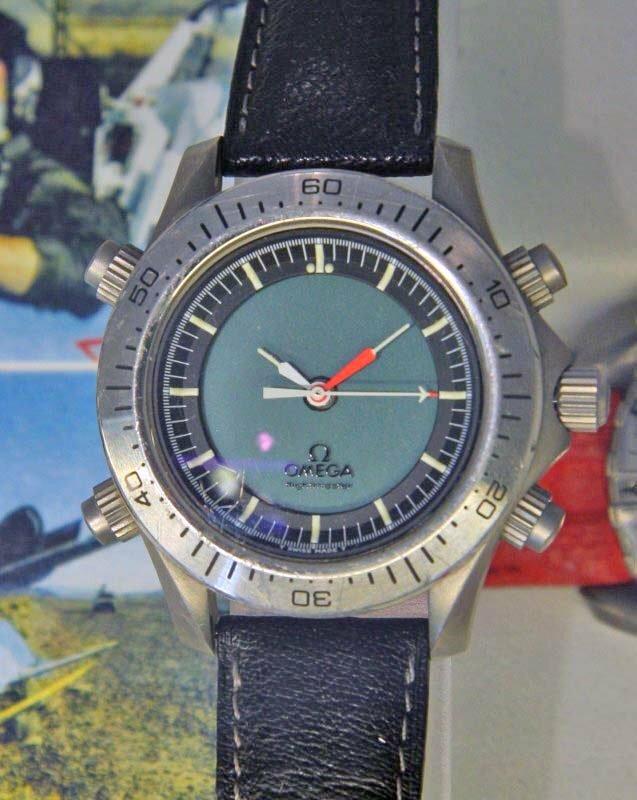 The namesake NASA X-33 program had already been cancelled in awkward embarrassment years previously despite massive spending, and unfortunately for Omega it was growing difficult to maintain credibility selling an “Astronaut’s watch” bearing the same tainted name. And despite the aviation and space pedigrees the X-33 was never a blockbuster seller in the regular retail market, with pricing perhaps among the biggest reasons for slow sales. At its price point (MSRP about US$3400) it was relatively expensive for a sport or tool watch when similarly-featured models from competitors like Casio could be had at a fraction of the price. And though technically superior and well-matched to its intended space and flight applications, quartz technology can unfortunately be a hard to sell to consumers at those prices, especially with the misgivings about the X-33’s accuracy. And though quite functional quartz lacks the prestige, sentimentality, and nostalgic tradition of a traditional mechanical movement, something consumers who would spend such a sum on watches still seem to desire in a what is still a “luxury” watch. 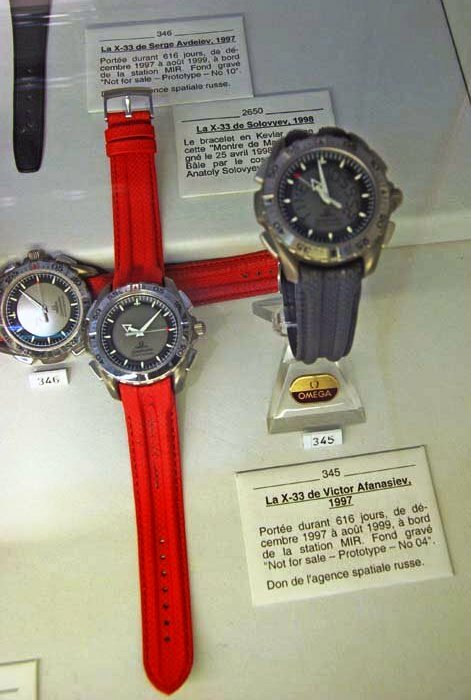 In spite of the more recent resurgence of popularity among enthusiasts now that unavailability affords the X-33 a relative degree of exclusivity, during its production lifespan the lack of enthusiasm was not confined to the regular retail consumer market but shared by many watch enthusiasts. Many enthusiasts remained unimpressed by the quartz-controlled movement and dull LCD-grey dial, and some Speedmaster aficionados objected vehemently to the use of the vaunted “Professional” designation on the dial of a quartz Speedmaster. In the eyes of some the X-33 was regarded as a drastically overpriced novelty watch driven by what was still “just” a bohemian quartz movement, especially after questions about build quality and accuracy shortcomings arose. While titanium’s lightweight and anticorrosive properties might arguably make it a nearly ideal material for wristwatches from a technical standpoint, titanium remains expensive to refine and notoriously difficult to machine and work with. The matte Titanium Oxide finish makes titanium very suitable for a flight watch where glare and reflections might be a distraction, but it also means the watch lacks the flashy “shininess” of traditional jewelry metals and the reassuring heft of steel or gold, something many consumers unfortunately seem to want in a watch they are about to spend thousands of dollars on. And when a Casio G-shock with similar capabilities could be had at a fraction of the price, it was become difficult to justify the expense to the consumers. Finally, perhaps the X-33 seemingly does not fit well within what seems to be Omega’s nascent premium up-marketing strategy. 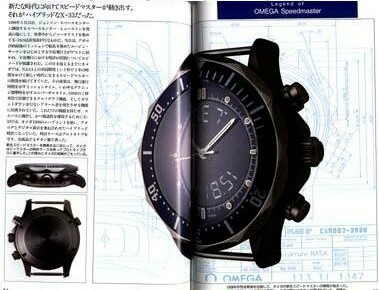 Despite a decades-long tradition of Omegas in space, Omega’s recent up-branding efforts in concert with the development of the new in-house/in-town/in-family calibers with their exclusive co-axial escapements would seem to diverge with what is “just” a lowly quartz watch. There were also darker speculations that the X-33 was discontinued under the spectre of rampant quality and longevity shortcomings and alleged NASA complaints about durability. While these rumors have been neither confirmed or denied explicitly, the multitude of problem-free X-33s in owner hands and indisputable evidence of continued and ongoing NASA and international space usage would seem to discredit such speculations. At present no new stocks of X-33s are being shipped from the factory through regular retail distribution channels. Occasionally, an Authorized Dealer may still have old remaining unsold stock available but this grows increasingly rare. 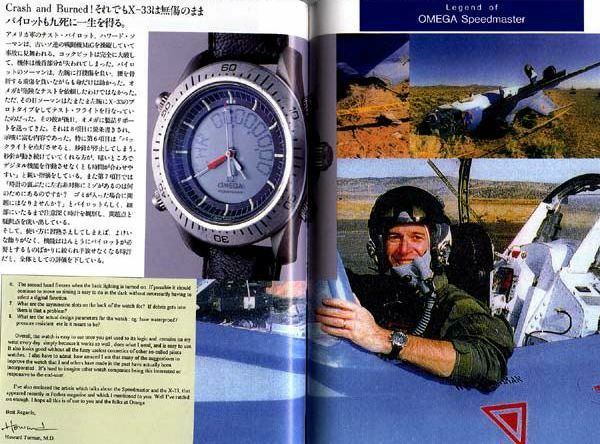 If they can be found on AD shelves, Omega has repeatedly stated that just like any other Omega model, any new X-33 purchased from an AD will be covered by the full 2-year international warranty from the time of sale even though the model has been discontinued. It’s hard to say what may follow the X-33, and it increasingly begins to appear that there may be no next chapter for the Omega Speedmaster Professional X-33. In Spring 2007 Omega claimed in promotions for the 50th Anniversary Speedmaster Professional models that Omega was “currently designing a Speedmaster to meet the demands of the next generation of astronauts.” The 50th Anniversary model had been met with mixed reactions, so much so that news of a new “space watch” quite nearly overshadowed that of the anniversary model. But in the months following there was no additional news or mention of any new watches for NASA, and at the time of publication it has already been nearly two years since the X-33’s retail discontinuance. If a new model were being developed with the same heavy field user input as the X-33, it would seem almost inconceivable that the news could indefinitely be concealed in today’s internet-aware world and continued scrutiny of NASA photos has yet to reveal anything that might be a new Omega. Given this lack of subsequent news, it would begin to seem that the offhand “currently designing” allusion above may well have been a remark by an uniformed copywriter who simply didn’t realize the impact such a seemingly simple and innocent statement might have in the collector community. Several things might tend to support such a hypothesis. First and foremost is that despite collectors’ renewed fascination with the X-33 since its discontinuance, it may be easy to forget that from a retail sales standpoint the X-33 was something of a misfire. At its price point it was not competitive with comparably featured but cheaper watches from other makers. It was somewhat disdained by collectors of mechanicals during its retail life cycle. Even news of its discontinuance elicited fairly little emotion in the collector community. As such it would seem unlikely that Omega might be ill-advised to attempt to target this market again. It is also helpful to consider, “Just what exactly could Omega replace the X-33 with?” Like so many other consumer electronics, the potential for continued development is becoming constrained by the performance limits of existing battery technologies. The backlight and loud alarm of the X-33 are massively power hungry and require a strong power source. A relatively short battery lifespan is a lamentation among owners, and collectors have long speculated that the battery life of the X-33 is insufficient for extended duration, years-long missions like those aboard the ISS (and any potential excursion to Mars). And indeed, at least one other X-33 is rumored to have suffered a battery failure during an ISS mission. And what could Omega replace the X-33 with anyway? A “Kinematic” mechanical/electric hybrid design like that used in the earlier Omegamatic might be one possible answer, but the capacitors they typically use to store power need replacing almost nearly as often as batteries, and are more expensive to boot. Solar technology might be another answer, but an astronaut’s wrist might not be exposed to enough bright light aboard a spacecraft to keep a battery powered over the long term. At present major competing theories include speculations that a successor model will either be a partial surrender to the technical challenges and closely based on the X-33, a solar-powered design of some sort, or (among the optimists at least) some completely new and different technological great leap forward. However, especially in light of Omega’s continued emphasis on the new Frederic-Piguet based mechanical chronograph calibers with their exclusive co-axial escapements, there could even be a partial return to tried-and true original mechanical Speedmaster Professional roots. If nothing else, this would address the power problem quite neatly so long as astronauts raised on a lifetime of quartz watches can remember to wind them. This problem after all has occurred on missions dating back as far the Apollo program, understandable given the dissociation with solar time and biologic circadian rhythms. So it might not be too surprising if the X-33 were simply relegated to a low production, limited distribution status for years to come with no eventual replacement in the Omega lineup. 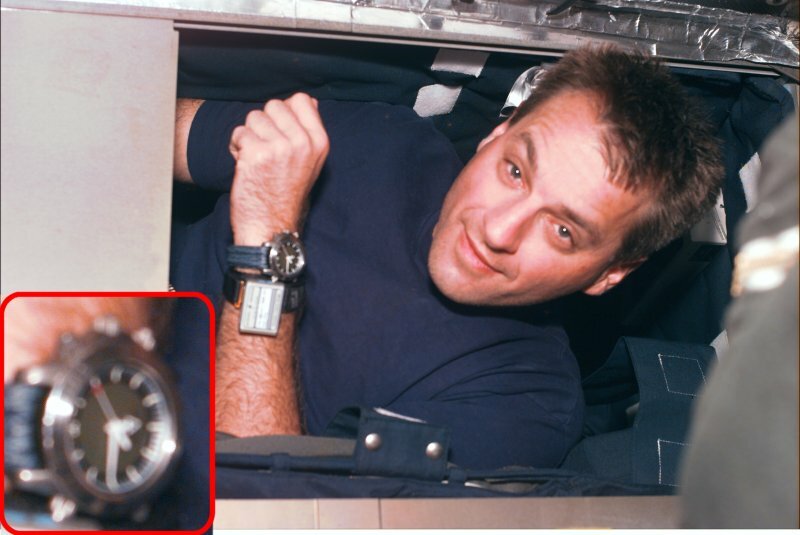 It would seem quite possible that a Casio G-Shock with comparable features (and already long issued by NASA as one of four authorized choices for mission watches) may completely supplant the X-33 in space, just as they did in the regular retail market. In light of such considerations it could be surprising to learn that any genuine and dedicated effort at developing a replacement for the X-33 is actually underway. Only time may tell, but if there is to be no replacement then the discontinuance of the X-33 might well have quietly marked the end of an era for Omega. Great research and a classic on the X-33 literature! Thanks! I will be buying one from a friend who bought it used from a Squadron aviator. This one is now being refurbished with newer crown clean bezel. Bracelet and casing have been cosmetically touched up too. The watch has been to Bienne twice for servicing, one for water ingress. The original pilot had used it for swimming! haha! Bienne did not replace the Gen1 crown, though the watch is a Gen2, I was told…In anycase, I am thrilled to be able to acquire this one, used in real life service. 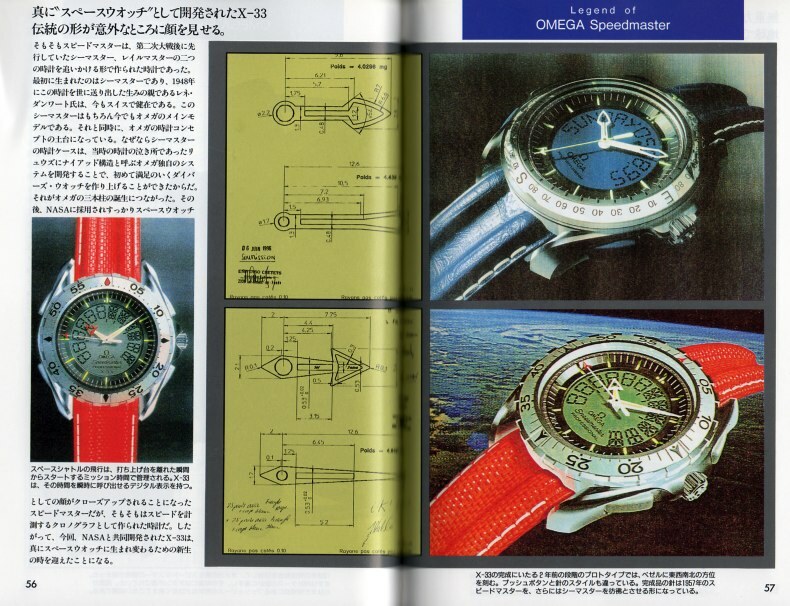 Seamaster-Multifunktions on a picture I found in your papers. instructions by heart, I can not use all the funktions any more. If you can send me a MANUAL I´ll be very HAPPY!